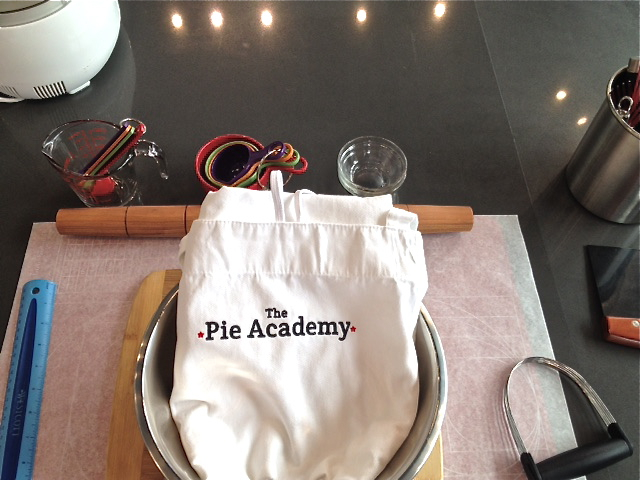 The calm before the pie making storm…. 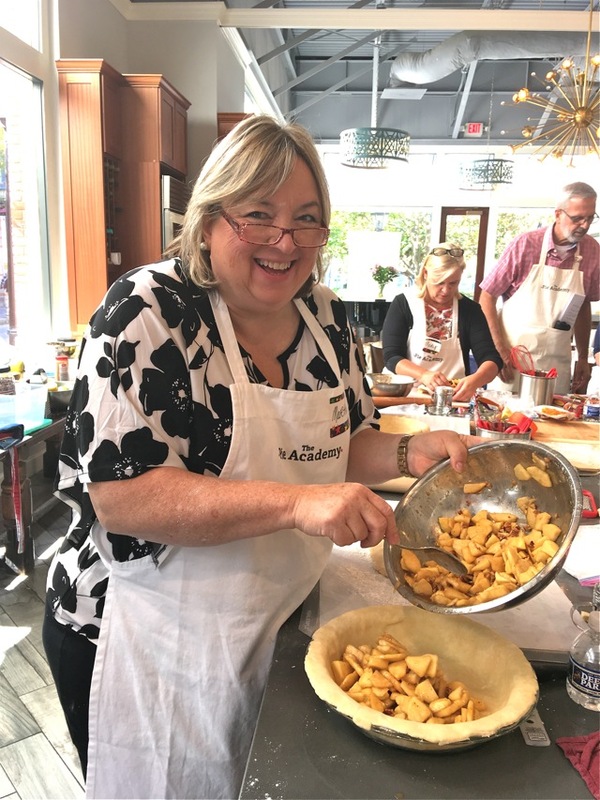 Saturday morning, this past October 22nd, thirteen members of The Pie Academy convened for a weekend of pie making, sweet and savory, in Charleston, South Carolina, a warm and welcoming American town like no other. 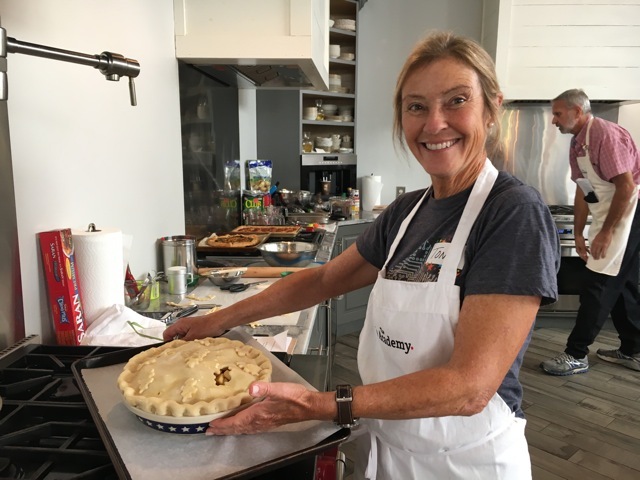 Martha is all smiles over her apple pie. 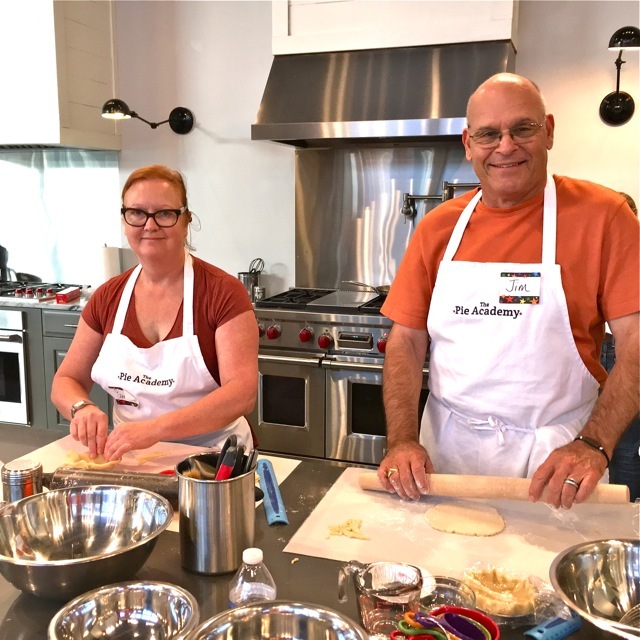 Yours truly served as instructor and orchestrator, ably assisted by my wife Bev, whom – I often say – has the unenviable job of doing all the stuff I’m lousy at or never get around to. Makes her a pretty busy gal. 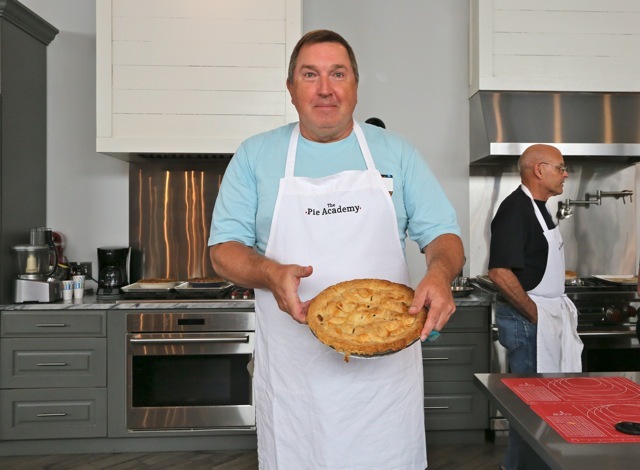 As you’re probably aware, the weekend in question marked the third annual Lowcountry Pie Getaway. The first one was held in Savannah in 2014 with five members in attendance. 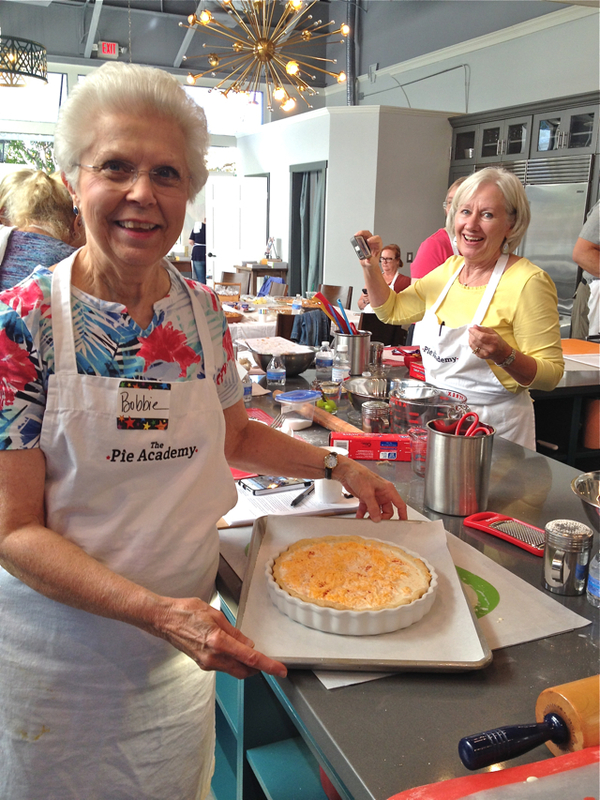 Eleven of you attended last year’s Pie Getaway in Charleston. This year there were thirteen. If this trend continues – to borrow a line from the movie Jaws – we’re going to need a bigger boat. But perhaps not much bigger. From the very start we designed the Getaway to be an intimate gathering – less like a highly structured classroom setting than an informal pie making workshop among friends. We chose a venue and a host city that would help facilitate that ideal. And, unsurprisingly, we attract an enthusiastic crew of pie makers for whom this formula works beautifully. We’re not all equals in pie making skills, but our group is small enough to render any disparities irrelevant. One of this year’s attendees confided that she was quite nervous she’d be the only pie neophyte in the bunch. 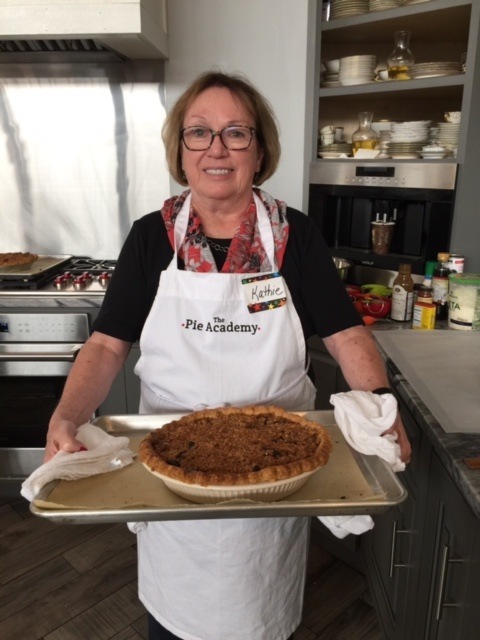 Turns out that about half the group had never made a pie before, or just a couple of pies, though you never would have guessed it judging by their handiwork. Impressive indeed. 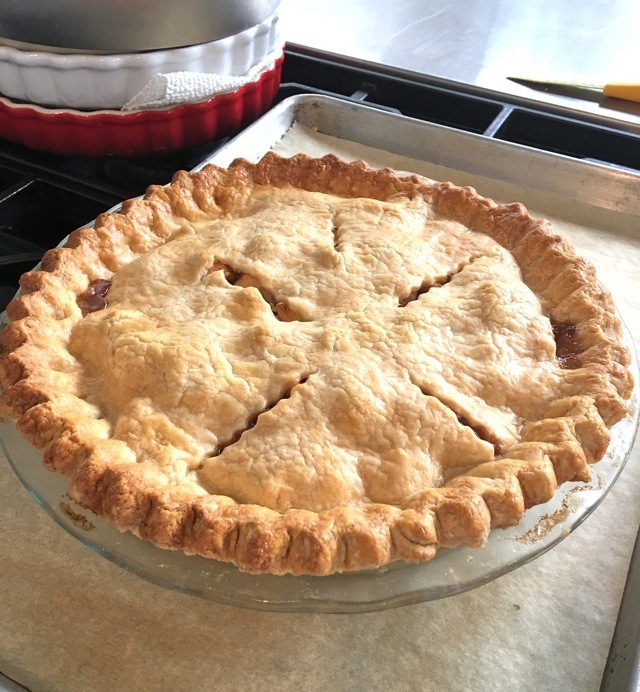 Sophie said this was her first pie. We didn’t believe her. If we design our Getaway to be informal and friendly, it’s not without clear objectives and a solid agenda. 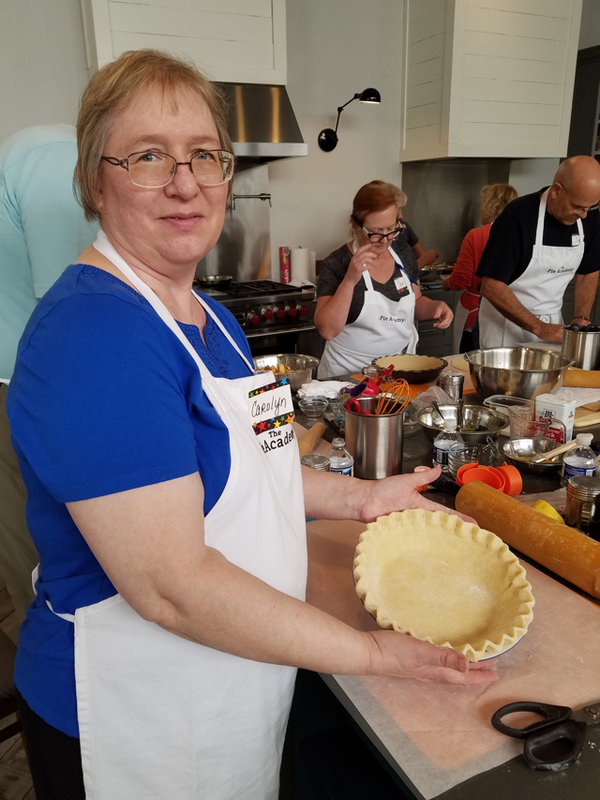 Indeed, I sometimes worry that I try to pack too much learning into a single weekend: there are pie doughs to master – one buttery, one made with shortening, another shortbread dough we use for mini pies. 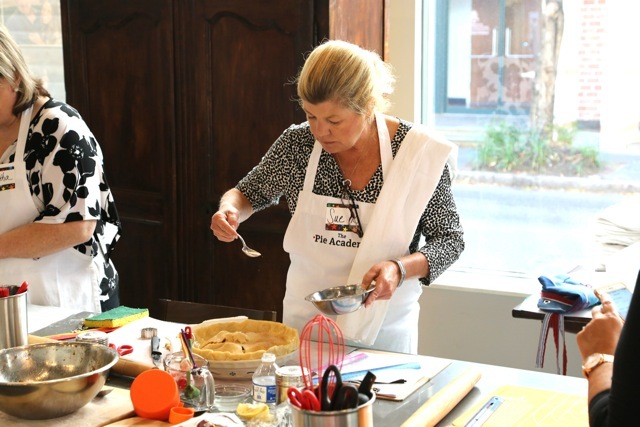 There’s a signature apple pie to design and execute; savory galettes, quiches, and tomato pie to prepare; mini pies to construct and bake; demos to watch, and tools to talk about. I’d be lying if I told you there were no tired feet by Sunday evening, but the sense of accomplishment is the best salve you can find. 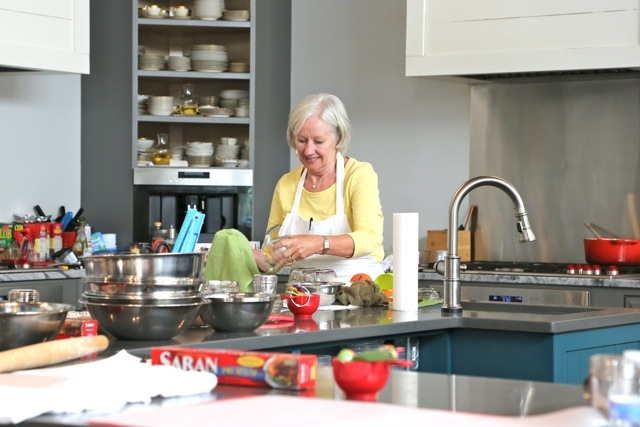 In fact, most of our attendees pad their Getaway weekend with additional days to visit outlying destinations in the Lowcountry – like Kiawah and Savannah – or to visit family in the area. You could spend a week eating at the best restaurants in town and you’d barely scratch the surface. Charleston is always on the short list of top foodie towns in the country. 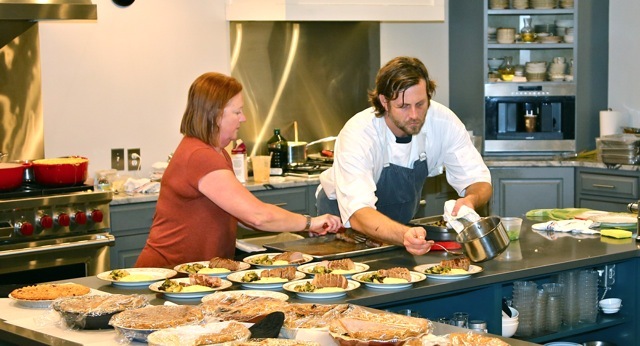 We always cap off our Getaway weekend with our Sunday Sendoff Dinner and this year – speaking of top foodies – we brought in one of Charleston’s top chefs, Jason Houser, to prepare a private dinner for our party of twenty, including family members and friends. Jason is a former nominee for the James Beard Award/Best Chef Southeast and he dazzled us with his smoked pork tenderloin on pimento cheese grits, shrimp tortellini, and more. Thank you, Jason, for such a memorable meal. 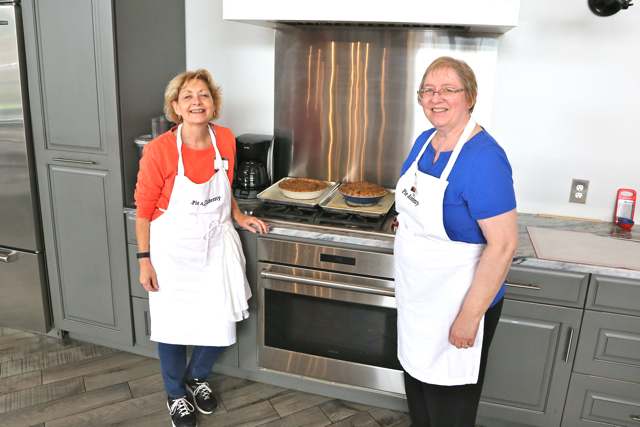 Mary and Sue standing guard over their tomato cheese galette. A few more thanks are in order, too: Charleston’s Grey Ghost Bakery was kind enough to provide cookies for our attendee’s swag bags. Fletcher’s Mill sent us one of their beautifully constructed rolling pins to round out our Pie Academy collection. 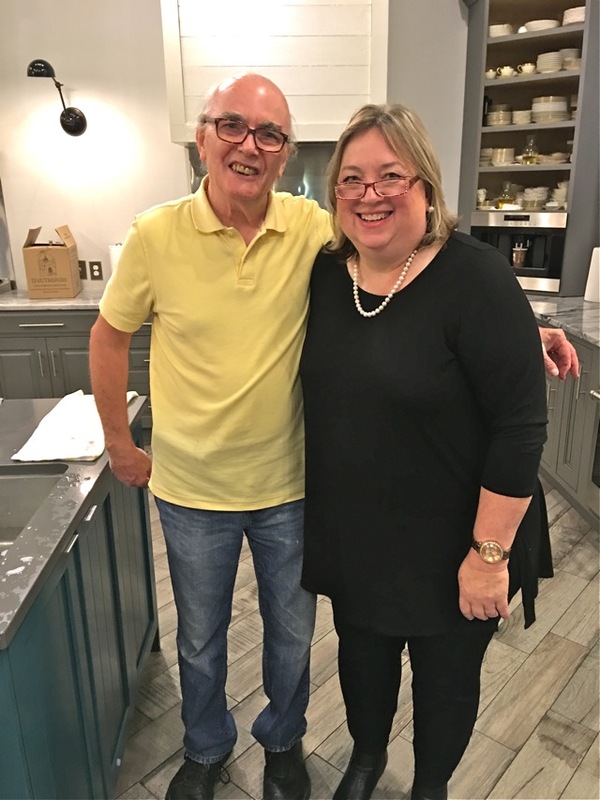 Chef Bob Waggoner – owner of our host facility – was once again the most gracious and accommodating of hosts. 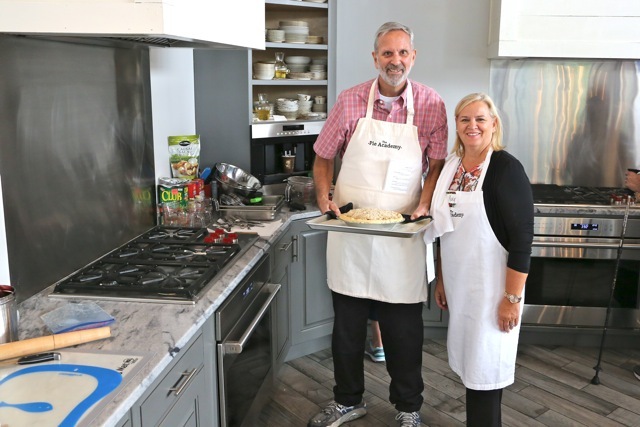 If you do nothing else the next time you’re in Charleston, have Bob make dinner for you. And I don’t know what we would have done without Paul, who washed dishes and ran errands for us all weekend long. 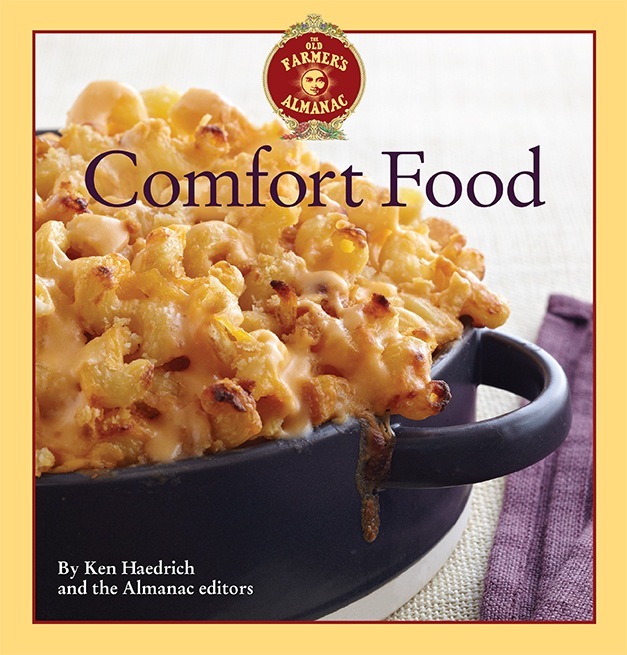 The leaves are falling, the holidays are looming, and you’ve been meaning to fill a few gaps in your Ken Haedrich cookbook collection. Or maybe you’ve been hoping to score some neat items from our online store. Have we got a deal for you: pay no more than $10 on our standard shipping and handling charges through the end of November. 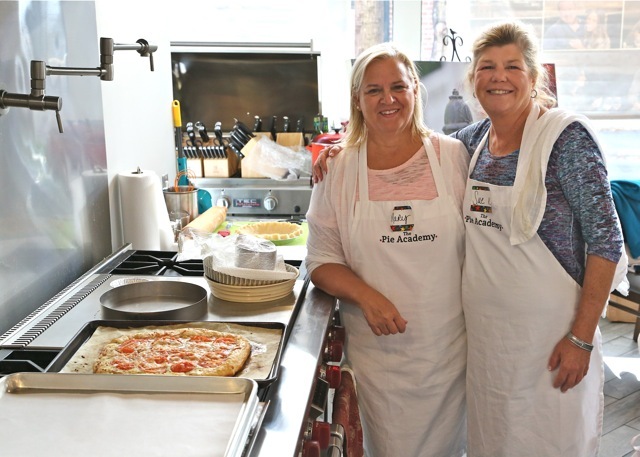 That’s right: spend $35 on Ken’s cookbooks, our wildly popular pie boxes, Pie Academy rolling pin or other merchandise and we’ll reimburse you through PayPal for any shipping charges exceeding $10. 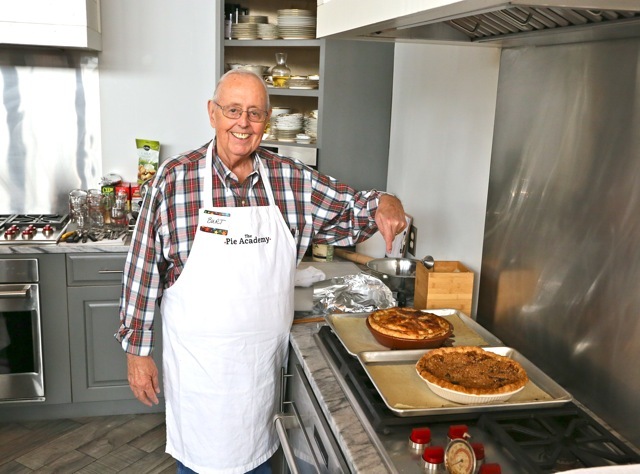 Perhaps you’ve been wanting to give an autographed copy of PIE to a favorite family member who has caught the pie making bug. 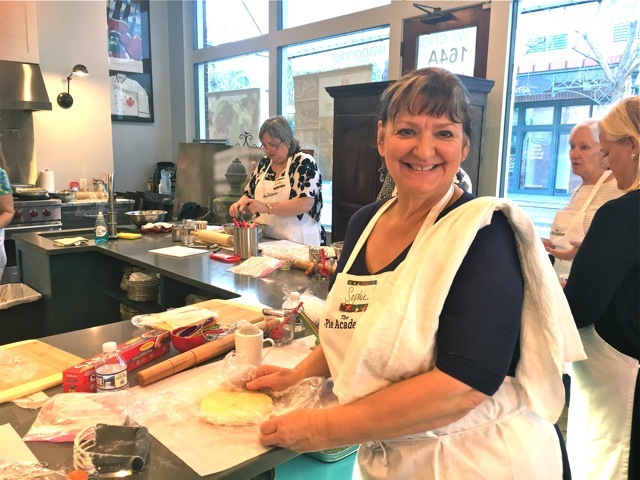 Or the cooler weather has put you in the mood for some favorite COMFORT FOOD or DINNER PIES or Ken’s delectable soup, salad and bread menus in SOUP MAKES THE MEAL. All you have to do is order from our online store during the month of November and complete the checkout process; we’ll reimburse you automatically for any shipping and handling charges that exceed $10. Remember, if you want your books autographed, please let us know in the note section of the order form when you place your order. It’s that simple, and simple is a good thing around the holidays, right? Sorry, but this offer is only good in the lower 48 states.